2011.11.27 バルパラ! 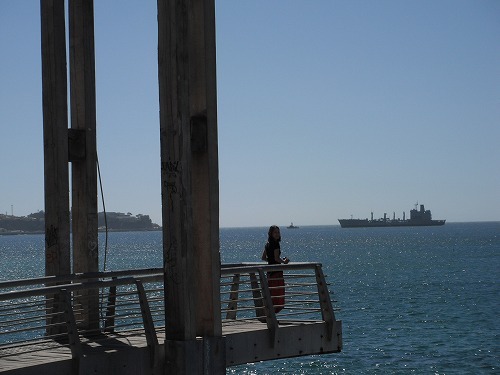 / The World Heritage, Valparaiso! This morning I went to the bread shop "Bimbo" with Yutaka to buy some breads for breakfast. After breakfast, I washed the linner of the riding jacket, the ground seat of the tent, and mat. We had pasta for lunch. As we had been eating luxuary recently, we wanted to have something simple. Then with YOSHI DR650 and Yutaka, I went to the supermarket "Santa Isabel" in Vina del Mar. This evening, we planed to do BBQ, so we bought 1kg of beef and 700g of pork. The BBQ was excellent. We were glad that Ryu was here with us. He is a good cook. 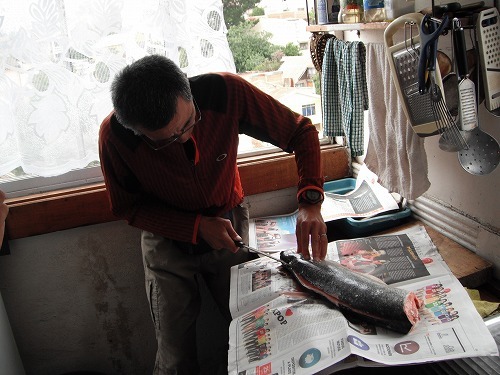 With Yutaka, I went to the fish market and bought 1.8kg of salmon for 7,000 pesos. After breakfast, Yutaka wanted to buy a tyre tube for his bicycle, so we walked to a cycle shop. There are 2 types of tyre tube - French and American - but here in South America, the most of tubes available are American type. As Yutaka's rim is suitable for French type tubes, so he researched on the web and found out that one of cycle shops in Vina del Mar has it on stock. We knew it was far, but we walked there. It took us 1.5 hrs (including a break at a cafe), and he got the tube successfuly. Back to the hostel, I cut the salmon into pieces for sashimi. Skin and bone were grilled. Yum. As Chie was away (went to Valparaiso), 5 guys finished 1.8kg of salmon! We ate too much. Mr. Sasayama left here in the afternoon. He will take a bus to Puertomon, then will cycle down to Ushuaia. Have a nice trip! Ryu cooked Carbonara pasta for us for dinner. It was excellent. Chie will leave here tomorrow, so there will be only 4 guys. I will leave here by this weekend. This morning I saw off Yousuke and Shinya, then after breakfast, Jose and I went to the centre of Vina del Mar to buy a piece of cake. Today is the birthday of Mizuki. After we came back to the hostel, we had cakes and coffee with Mizuki to celebrate her birthday. We had fried rice for lunch. We had been eatng luxuary, so having soemthing simple was refreshing. Then I went for a walk along the sea shore with Mizuki. I have been eager to date with someone for a long time, so dating with a beauty from Kyoto was "Priceless!". We went to the place where the herd of the seals lying. We enjoyed watching their behaviours and walked back to the hostel. She left the hostel around 7:30pm as she had to catch 8pm bus to Puertomon. Just for 3days, but I could have a good time thanks to her. Maybe we areable to catch up in Ushuaia. Buen viaje mi amiga. 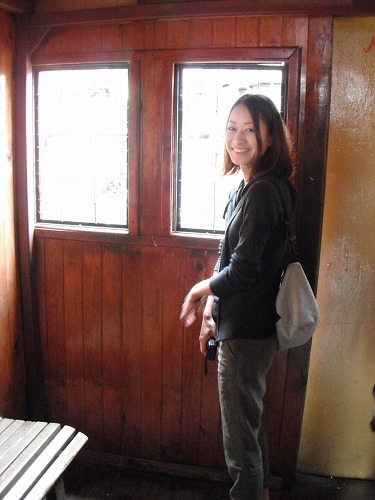 Another girl - Chiyo - came o the hostel. So now we have 7 guys and 1 girl. We cooked Japanuese style curry and chiken meat ball soup. Keisuke donated us a Japanese curry paste, so we all enjoyed the curry! I have been eating too much since I came here. So I gained weight. Keisuke and Katsuya will leave here tomorrow. I think I should get ready soon. Today we got a whole salmon, 3.8kg! 15,000 pesos. And we got abalone for 1kg and clams for 2kg. Back to the hostel and we decided to make Sushi, so we went to Jumbo to get rice vinegar and other ingridents. Mr. Sasayama fileted the salmon and I cut it in pieces for Sushi. I was doing this everyday 10 years ago. Ryu ixed rice vineger, sugar and salt into steamed rice and now we were ready to make SUSHI! Today we made "NIGIRI" style, which is the most popular style in Japan (roll sushi is not popular in Japan). Everyone, except me, had never actually made "NIGIRI" before but we made it anyway. Some made it really big, some made it small. 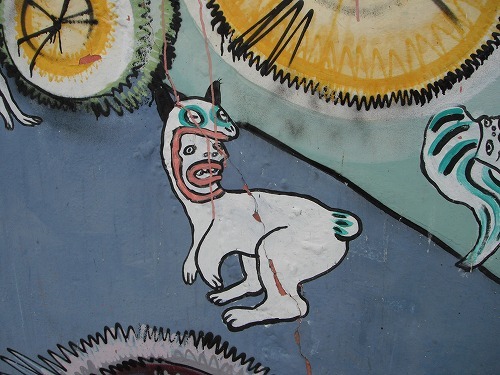 Personality of each person could be seen in "Nigiri". We were so happy to have SUSHI away from home. It wasn't the best quality, but we were so satisfied. Mussels cooked in white wine were served as well. Altogether it cost us 4,300 pesos each (including dinner). Very cheap! After lunch, we all talked in the dinning room. Mizuki responded in Kyoto diarect to me, so I had a great time. At dinner, we grilled the salmon, made salmon soup, steamed abalone in wine sauce and made salad. Are we having too much?? Tomorrow, in the morning Yousuke and Shinya will leave here. Then Mizuki wil leave here in the afternoon. I should get ready to move on too! バルパラ! 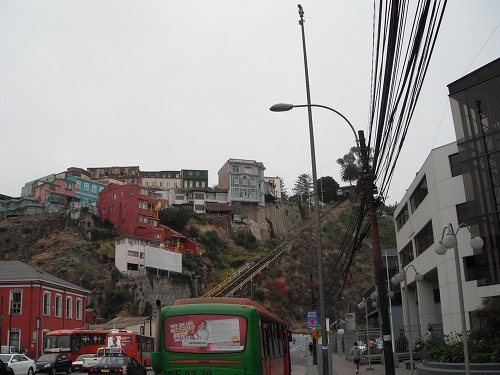 / The World Heritage, Valparaiso! Today we went to Valparaiso. 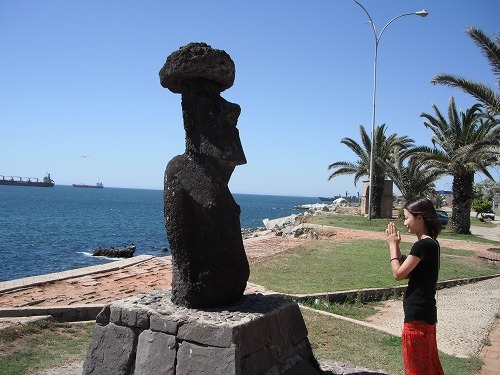 Valparaiso is the 2nd largest city in Chile (I have not confirmed this fact yet) and registered as the UNESCO world heritage. 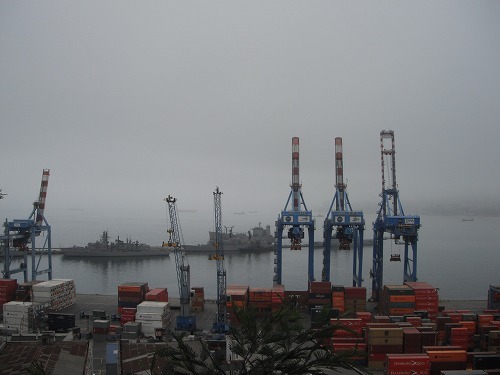 The city flourishes as the main port of Santiago and the parliament of Chile locates in Valparaiso. 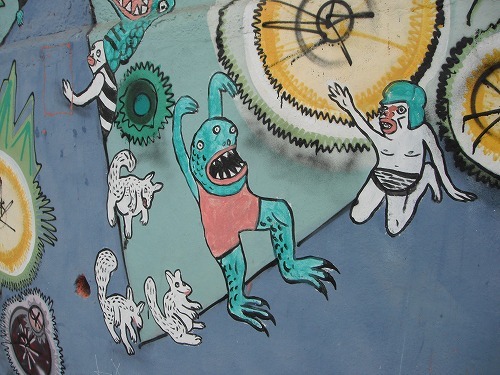 What made this city as the world heritage would be the unique layout of housing - built on steep hill side and graphiti arts on streets. Also the number of "Ascensors" - escalators - are the main tourist attaction. Those ascensors are used as everyday transport by locals to climb up and down the slopes. So, how was our visit of Valparaiso. Well, in my opinion, why UNESCO chose this city as the world heritage? It was overcasted today, so the scenery was not the best, I must say. 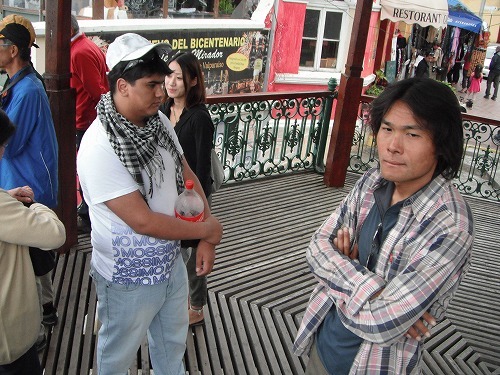 But we all enjoyed the visit to Valparaiso, just walking around and talking nonsense. We had lunch at a local restaurant. For just 2,500 pesos it included bread, salad, soup, main and coffee. It was a good value. 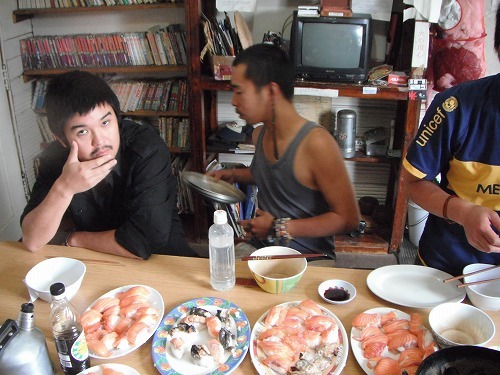 We went back to the hostel and cooked nice dinner with seafoods. If there will be salmon on the fish market tomorrow, I want to make sushi.